The This material is for single use, only, and is not to be copied or used in any form outside of the contractual boundaries from which it was provided by the copyright holder. The article argues that traditional processes to create a vision impose an image on the organization. Using native American visioning principles, the article suggests that true visions are creating by questing for a vision, which in modern terms means creating a container for the vision to emerge. Contrary to typical visions, the emergent vision defines how the world is different because the organization exists. If it meets this requirement, there is a tendency for resonance to develop between the organization and the people within it. The "...vision includes a visual image of a future state that would not exist without the creative activity of the people concerned. and also incorporate personal values of the participants." (p. 336). "It shows a future achievement aim that can be readily visualised [sic]. The vision statement is the formal document that includes a desired future that is explained in a mission statement, a glossary of key terms, and a set of guiding or core values that support the mission statement. (Wall, Sobol, & Solum, 1992, pp. 32-33). In corporations, ..."mission statements— sometimes called value statements, credos, or principles—are the operational, ethical and financial guiding lights of companies. They are not simply mottoes or slogans; they articulate the goals, dreams, behavior, culture, and strategies of companies more than any other document." (Jones & Kahaner, 1995, ix) It is common for an organization to have a statement of vision as well as mission statement that conveys how the organization will create the vision. Symbolic representation of the vision can be very powerful if it captures the intended meaning. Corporations invest heavily in the development of corporate symbols that can convey the desired meaning of the corporate vision and mission. For example, use of "the Rock" to represent the stability of Prudential as a company is widely recognized. Consequently, the vision statement, composed of a vision, a supporting mission statement, and core values, is the primary force for meaning-making throughout the organization. It creates a common understanding of what distinguishes the organization from other organizations (Abrahams, 1995; Lipton, 1996)). It creates a special identity (as compared to other organizations)1. This special identity taps into the power of unified diversity. More specifically, at the core of every individual within the organization will be a shared or common understanding that may not be expressed in words beyond the vision statement itself. However, the meaning of the vision statement touches parts of the person that is unique to them individually and yet binds them organically to everyone else2. In many ways, it is the creation of a community comprised of many individuals held together by common meaning (Lewis. 1997). Over the last few decades, organizations have recognized that the vision must be steeped in common understanding and meaning. This led to conscious development of core values that would support the vision and how the organization hopes to be in the world. A value is an enduring belief pertaining to preferable personal or social behaviors and outcomes from such behavior (Rokeach, 1973). "It is the absolute or 'black or white' learning of values that more or less assures their stability and endurance" (Bumpus & Munchus, 1996, p. 169). "Collectively.... value systems provide an inner, often invisible, governance system which can allow individuals and their organizations to stay on course in turbulent times" (Kriger & Hanson, 1999, p. 302). More basically, "[c]ommon values are the glue which binds an organization together; they motivate and create a sense of community" (Brytting & Trollestad, 2000, p. 55). "Today's organizations, both profit and not-for-profit, have to balance an increasing array of conflicting forces and values. Stakeholder demands are diverse and numerous. No individual is in a job without conflicting demands—for innovation and stability, for quality and efficiency, for goal clarity and flexibility, for short-term results and long term effectiveness" (Kriger & Hanson, 1999, p. 302). Moreover, within this malaise of conflicting interests, "[a] fundamental issue in organizations is that 'right' human relationships are essential for effectiveness in our work systems"(p. 305). At issue as discovered by many organizations is that if the organization does not "stand for something" through a set of organizational values, then "it stands for nothing." In other words, organizational success is dependent upon organizational values that convey a deep concern for the employees as individuals and that reinforces the meaning and purpose of the organization (Kouzes & Posner, 1995). "With people-oriented values, successful organizations were found to use employee groups to solve problems, promote cooperative interaction, and have employees influence important issues" (Tjosvold, Dean. 1998, p. 44). An alternative method of developing a vision is to quest or search for the vision as done by indigenous and religious leaders for thousands of years. Reprinted with permission: Otto Scharmer, Theory U: Leading Profound Innovation and Change by Presencing Emerging Futures, Draft, May, 2004, p.8. As a process, it relies on what is inside the people seeking to develop the vision, an emergence3, if you will, and yet can incorporate the findings of the various qualitative and quantitative research methods4. Harrison Owen has brought a variation of this form of visioning process into modern organizational meetings through his development of the process called Open Space Technology. (Owen, 1997a; 1997b). Similarly, Weisbord and Janoff's Future Search (2000)and Cooperrider's Appreciative Inquiry (Cooperrider, et.al. 2000) along with the many other forms of whole-scale change models seek to tap into this method of questing for a vision. More recently, Senge, Scharmer, Jaworski, and Flowers (2004) have further refined the application of this form of vision questing to organizations through the process of presencing as depicted in their U-Model. In this situation, the U-model, it is clearly indicated that the focus of the model is to quest for vision. Vision questing is a different process than the visioning done in most corporations and organizations. Using the Gestalt awareness process model shown above in Figure 1, corporations and organizations tend to lean more towards an "active, directed awareness" model to establish a vision whereas vision questing would be an "open, undirected awareness" model. In truth, the actual questing process involves both forms of awareness, whereas initially the open, undirected awareness functions as the questing process that leads into the active, directed awareness that becomes what will eventually manifest the vision throughout the organization5. Questing is an emergent process that portrays how the world will be different because this organization and all of its uniqueness exits, and the mission is the action statement supporting the vision. Core values within this context become the container which supports, defines, and adjusts the behavior of the organization to be consistent with the emergent vision6 . Over the last several decades, vision statements and vision questing as a process have become sterile and inverted in their application to most organizations and nearly all for profit corporations. Sterility has surfaced through the lack of the organization's ability to provide meaningful vision that can evoke and emote serious commitments to a single compelling picture. Inversion has evolved through the lack of full body, in the moment, presence. In other words, most vision statements are created by thinking heads that drag their body along for the ride. These fact creating and interpreting processes negate the fact that unless meaning is created that evokes and emotes commitment, at best, the organization will elicit some form of compliance, albeit temporarily and without personal involvement beyond doing just enough to keep the job or to prevent notice from management. Over the last two decades, while learning about my native American heritage (Stevenson, 2001), I discovered that questing for a vision involves fourteen basic or fundamental processes that explain the process of questing for a vision. The fourteen fundamental principles are Zen-like in their presentation in that they may seem enigmatic and filled with paradoxical riddles, but when assessed and practiced as a whole, the principles enable a quality of insight into self and other that is more than the sum of its parts. This broader and deeper sense of understanding begins the process of reawakening an awareness of relational perception that has been overshadowed by conventional analytic problem solving. (1) Visioning is a personal process that is begun in isolation; however, it is fundamentally conversational and social. (2) Even though it may seem that nothing is happening at the time, the experience itself changes the person, group, and/or organization. (3) The experience enables us to become more of who or what we are, and therefore changes how we are in the world. (4) Visions come to children, and to adults who can make themselves like children. This principle echoes the late Kathy Dannemiller's Whole-Scale Change premise to bring open-mindedness together with open-heartedness. This "child-like," passionate world is one wherein judgment is suspended and playfulness is possible, even necessary. It is that place where "what is" is defined through moment-by-moment experience instead of through various pre-existing internal constructs or through dictates from the outside and from the past. It is a place where both naivete and cynicism lay at rest and strategic thinking is to understand that what lies within the silence is without thought. (5) Vision comes when we are humble and pitiable. Vision questing in its earliest form has been called "crying for a vision" and "lamentation. "7 More recently, vision questing is described as being receptive and vulnerable without being totally exposed, often described as being at the boundary of oneself, or making contact with the Self or Other at the edge of deep discomfort. These characteristics mark a place where the veiled defenses of how to be in the world are lifted—like the moment just before one acknowledges that the emperor has no clothes. Because it is an experience, words fail and we realize a sense of smallness that may not have been known till known. (6) Vision's power comes as we listen to our own, internal stories. We all carry within us domineering voices from the past as well as the unwritten yet indelibly known rules of being a member of a family, a community, or an organization. Gestalt theory refers to these internal constraints as introjects—image-creating and behavior-controlling concepts that we have "swallowed whole," that is, taken into ourselves on faith or demand without our conscious and/or reasoned input. These introjects are in many ways unconnected to the present, yet they are still impacting every moment of one's life. They are personal and/or social constructs that we have maintained as ways to "do" ourselves or ways "to be." Vision questing encourages these internal stories to surface, to come into awareness. As we give voice and ear to these internal stories, they tend to fade into the background and older and more deeply personal stories can begin to be told and, in the process, reborn. (7) Vision's power comes as we learn to communicate with our deepest selves. Our deepest self is often the site of terrible fears and "unspeakables." By allowing these two negative aspects to fully and clearly emerge, we can decide upon and release what is no longer applicable. Organizations that are able to break down cultural norms that hide within the day to day activities like water is to a fish, soon have a new pair of eyes from which to see and therefore a new voice from which to speak. Often, old dreams and hopes surface from these deepest selves, reminding us of a forgotten self, of who and what we really are as an individual, family, group, or organization. (8) Vision's power comes when we can honor those dreams that energize the very essence of who we are and how we want to be in the world. Forgetting or repressing one's heartfelt dreams in the interest of complying with social expectations or cultural norms banishes and damages the soul. Remembering the dreams of the soul soothes us deeply, and reminds us of our sense of purpose and of that which creates meaning in one's life. Organizations often lose their dreams when complexity and unconsciousness replaces what has heart and meaning with restrictive policies and procedures that are held together by the unwritten and rarely talked about rules of how we do things here. (9) Vision's power comes to us when we can be open to something greater than ourselves. (10) Vision's power comes as we listen to the stories around us. Part of the success of most large-scale change is accomplished through storytelling. Listening to the stories of others begins to open our minds and hearts, if we will only sit with the story without judgment, allowing ourselves to be aware of how the story is affecting us physically, mentally, emotionally, and spiritually. Being eager to respond immediately with our own story can distance us from the storytelling other. The story we listen to well, without judging or forecasting, can touch our heads and our hearts in unforgettable ways. Once this occurs, we begin to hear a familiar story within ourselves that may have been forgotten or simply waiting until now to be re-membered. (11) Vision's power comes when the story of a person's life joins the circle. Building sufficient common and heartfelt ground for a clear and compelling picture to surface enables the person to regain a sense of community with all of mankind and with nature, and to assume responsibility for one's place in the world. As the vision of the individual and/or organization surfaces and joins with others', a deep sense of belonging is engendered. Such belonging becomes the "container" that holds and protects the shared vision. This container is community and it can not be dictated. (12) Vision's power comes when a person realizes a story that already exists. Often, vision is experienced as a deep knowing, akin to double loop learning where new meaning is created by looking at the structure of how and why things are done instead of changing what is done. This knowing is similar to the 100th Monkey phenomenon, where once a critical number of a species learns a new skill or awareness, often associated with the number 100, the learning moves through the morphogenetic field and all of the species knows. Although the vision is inevitably something that already exists, the awareness of it as a deep knowing is new. Much of what makes a true vision so powerful and so compelling, then, is in fact its unfolding of an awareness of what has always existed. (13) Vision's power comes when we add a new episode to that story. The personal vision illuminates how the world is different because of one's single self, and brings us to a realization that "fate" is not what happens to us, but is what we are when we are true to ourselves. Hence, the personal vision expresses a stage of "coming into one's own," wherein the individual has stepped fully into who he or she is as a mature and contributing member of a community. The organizational vision, similarly, kindles the awareness of how the world will be different because of the organization's existence in it. The organization's visioning experience is akin to coming to understand the fullness of its existence in very basic but powerful terms—in terms of the people who will be fed or the pollution that is created and not just in terms of the number of jobs provided, or in organizational quality of life, or in amount of profit gained. Vision provides exquisitely human depth to the organization and an awareness of its innate responsibility to itself and the rest of the world. (14) Vision's power comes when the story of a person's life becomes that of life as a whole. Visioning is transforming. Whole-scale change models, such as Appreciative Inquiry, Future Search, Open Space Technology, and the U-Model recognize that the "space for creativity in an organization is a dialectical state of tension between over control, embodied in the legitimate system, and chaos, embodied in the shadow system...New knowledge is constructed in 'communities of practice, the shadow system of learning organizations. Knowledge workers join communities because they have something to learn and something to contribute." (Coleman, 1999, 35, 37) To tap into this new knowledge, vision must be quested and not reinvented from existing forms of thinking or knowing. The fourteen points can be used as guidelines or guiding principles. As a process that is investigating an open undirected form of awareness building, it is contradictory to try to solidify each of the fourteen points into an exact procedure to be used in the visioning process. Rather, it functions more as a set of principles superimposed over the visioning process. Beneath these superimposed principles, the actual process involves using open-ended questions, free association, and dialogue. Like the original visioning process, the most effective processes have been where the individuals or organization are taken from their traditional habitat and brought back to nature. Not a natural settings with lodging and scenic views and golf courses. But, a natural setting where old patterns can be broken, old fears faced and dissolved, and the blanket of mother nature can provide the comfort needed to re-member who we are. Therein, visions emerge that remind of how the world is different because we exist. Abrahams, Jeffrey. The Mission Statement Book: 301 Corporate Mission Statements from America's Top Companies, 1995. Berkeley, Ca. : Ten Speed Press. Brytting, Tomas & Trollestad, Claes. (2000) Managerial Thinking in Value- Based Management. International Journal of Value-Based Management, 13, 55-77. Campbell, Andrew, (1997) Brief Case: Mission Statements, Long Range Planning, . Vol. 30, No. 6. 931-931. Carver, John. (1997) Creating a Mission that Makes a Difference. San Francisco: Jossey-Bass. Cooperrider, David, Sorensen, Peter F., Whitney, Daina., Yaeger, Therese F. (2000) Appreciative Inquiry: Rethinking Human Organization Toward a Positive Theory of Change. Champaign, Illinois: Stipes Publishing. Dent, Eric B. (1999) Complexity Science: A Worldview Shift. Emergence, Vol. 1. No. 4. 5-19. Foster, Steven with Little, Meredith. (1992) Vision Quest: A Sun Bear Book. New York: Fireside. Gioia, Dennis. (1998) From Individual to Organizational Identity. In David A.
Whetten and Paul C. Godfrey, (Eds. ), Identity in Organizations: Building Theory Through Conversations. Thousand Oaks, Ca. : Sage. Johnson, Martin, (1999, Sept-Oct.) A feasibility test for corporate vision. Jones, Patricia & Kahaner, Larry. (1995) Say it and Live it: 50 Corporate Mission Statements that Hit the Mark. New York: Currency Doubleday. Kouzes, James M. and Posner, Barry Z. (1995) The Leadership Challenge: How to Keep Getting Extraordinary Things Done in an Organization. San Francisco: Jossey-Bass. Lewis, C. Patrick (1997) Building a Shared Vision: A Leader's Guide to Aligning the Organization; Portland: Productivity Press. Nanus, Burt. Visionary Leadership. (1992) San Francisco: Jossey-Bass. Owen, Harrison. (1997a) Expanding Our Now: The Story of Open Space Technology, San Francisco: Berrett-Koehler. Owen, Harrison. (1997b) Open Space Technology: A User's Guide, 2nd Ed. San Francisco: Berrett-Koehler. Riddington, Robin. (1996) Voice, Representation, and Dialogue: the Poetics of Native American Spiritual Traditions. The American Indian Quarterly, June, Vol. 20. 467-489. Rokeach, M. (1973) The Nature of Human Values. New York: The Free Press. Stevenson, T. Herbert (2001) Developing a Vision for a Non-Profit Social Service Agency, Unpublished thesis, Cleveland State University, 2001. Torrance, Robert M. (1994) The Spiritual Quest. Berkeley: University of California Press. Wall, Bob, Sobol, Mark R., and Solum, Robert S. (1992) The Mission Driven Organization, Roseville Ca. : Prima Publishing. 5 Senge, et.al (2004, 225) refer to this process as the seven capacities of the U movement. The process initially consists of suspending, redirecting, and letting go of pre-existing forms of perceptions/awareness. They refer to the transformative process as presencing. It transforms the individual, group or organization's existing will that maintains the pre-existing perceptions/ awareness so that the individual, group, or organization can enable the future to emerge. 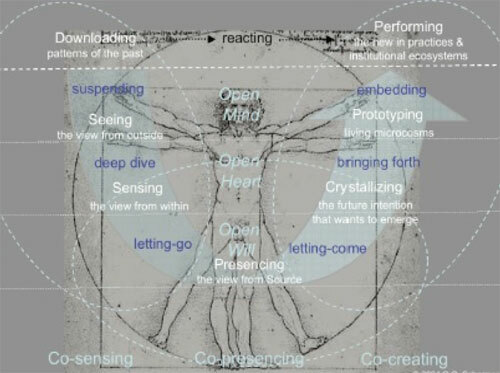 The emergence surfaces through the four remaining steps of the U-movement process of letting come, crystallizing, prototyping, and institutionalizing the new awareness or form of perception. 6 As a form of emergent vision, the quest for knowing how the world is different because we exist becomes a driving force for the organization as a whole or as parts that have evolved beyond the publicly stated vision. "This view... is very different from the traditional process that includes developing a vision, a mission, identifying stakeholders, and doing a SWOT (strengths, weaknesses, opportunities, threats) analysis. This type of analysis assumes that the environment presents opportunities and threats, not that the organization is an active player in creating opportunities and/or threats." (Dent, 1999, 13) Moreover, it assumes that the organization's existence presupposes an interdependent purpose and inherent responsibility to become fully what it is. 7 Lamentation is often defined as a prayer, song, piece of music, or poem passionately expressing grief or regret. Applied to the visioning process, it was the stark awareness that the individual had lost sight of their original purpose in life—how the world is different because they exist. This often translated into an awareness that the person had forgotten a part of what originally and uniquely defined them as a human being, Often this was experienced as having lost sight of who he or she was. Applied to organizations, most do not have even the slightest awareness that they have lost sight of who or why the organization exists except in terms of the bottom line. 8 With the recent fallout at Enron, WorldCom, etc. some might argue that money in the form of profits and executive compensation has become the god of many organizations with capitalism being the primary religion. In fact, the invisible hand of capitalism as originally described by Adam Smith clearly suggests spiritual underpinnings albeit amorally.